On Thursday 3rd November members of the Newport Kutaisi Twinning Association travelled to London to participate in 29th Annual Georgian Studies Day, held at The University of Westminster. The day consisted of keynote speakers followed by detailed papers on the theme of Healthcare in Georgia. The day was led by Dr Tamara Dragadze one of the organisers of the event. 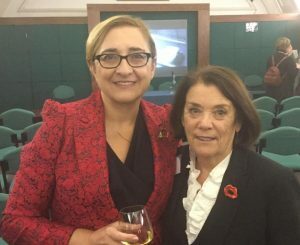 The Keynote Address was given by Her Excellency Tamar Beruchasvli the recently appointed Georgian Ambassador in the UK. She took as her theme “Healthcare – One of The State’s Major Priorities.” She firstly emphasised that Georgia is looking to the west and hoping to strengthen ties with both the EU and NATO. Her Excellency Tamar Beruchasvli The new Ambassador to the UK, giving her keynote address to those present. As part of the continuing westernisation of the country the national priorities include overcoming corruption and developing the education and healthcare systems. Most important of the statistics she reported about healthcare is that there is a basic healthcare system which reaches the entire population 90% through the state provided system and 10% who have opted for private insurance. The funding for the system is state managed but the provision is largely private provision and it is seen as being a true public private partnership with many of the attributes of the best of the west European systems. Following the Ambassador Professor Amiran Gamkrelidze Director of The National Centre for Disease Control and Public Health gave a wide ranging and comprehensive survey of the work being done in Georgia to address health issues. Progress is being made in many areas and health screening for the more common cancers has become a reality through not on a scale to match the western democracies. A slightly surprising statistic that he shared was that while there is a good ratio of doctors in the population, there is a shortage of qualified and experienced nurses and this is an area of medical education that needs to be developed. After the Professor’s overview the rest of the contributions in the pre-Lunch period and the first part of the afternoon session were more technical in context – through no less interesting – covering Cancer Screening, Tuberculosis Management, Occupational Health, Haematology Training, Mental Health Services, Traditional Health And A Fascinating Paper On Bacteriophagic Treatments. As the afternoon progressed the papers turned to more accessible subjects, Georgian Healing Songs, Spas and Health Resorts and promoting a healthy lifestyle by hiking. For us the most arresting part of the day came just before we started on the excellent wine provided by the Embassy. These were the reports by The Twinning Groups from Newcastle Bristol and Newport. Sonia, speaking for us, gave a very positive report on the civic leaders delegation and the football project. It was illustrated by a slide presentation prepared by Stephen Marshall. 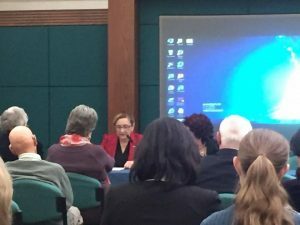 The British Georgian academic and activist community is a small and but very proactive group. The Newport Kutaisi Twinning Association, alone among the twinning groups without active financial support from the local authority has much of which to be proud. It was good to feel able to stand alongside the academics and activists and know that we are doing such a good job. 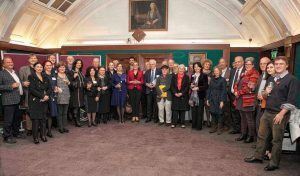 Georgian Studies Day celebrated its 29th annual day event on 3rd November at the University of Westminster, London. 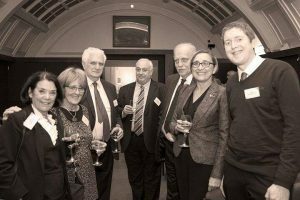 The day celebrates the academic, cultural, and social links between our two countries, as well as listen to the work done by both British and Georgian countries throughout that year. Newport Kutaisi Twinning Association is invited to present a report to participants as part of the twinning associations. NKTA is one of 3 twinning associations, the other two being Bristol- Tbilisi and Newcastle – Akhaltsikhe.